Ever suffer from yard envy? That’s when you’re walking or driving around a neighborhood wishing your yard looked as great as that one. Maybe this is the year to get a landscape design project done around your home. If so, don’t let any moss grow under your feet. In the upper Midwest, time is of the essence if you want to see results this summer. What’s your vision? Imagine what you’d like to see when you look out your window or when you drive up the driveway. Give this step some serious thought and you’ll be on your way. Living space: make your front or back yard an extension of your home where friends and family gather. Create a seating area, a spot for the grill, and a table for meals. Or, maybe you want peace and quiet with a pergola for shade and a bubbling waterfall. The practical: does a drainage issue need to be fixed or a walkway need repair? How about installing a kitchen garden to grow fresh produce? Keep your gardens and new lawn watered with a sprinkler system. The aesthetics: gardens, shrubbery, walkways, lighting, and stone edging can enhance the curb appeal to your home. What plant choices keep your garden in bloom throughout the season? When it’s all done, you’ll enjoy what you see for years to come. What’s your budget? Imagination is great, but money’s still the driver when it comes to landscaping. Start with a figure in mind and set priorities from there. So, what’s a realistic figure? 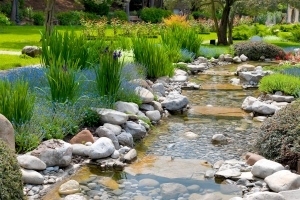 The American Society of Landscape Architects suggests budgeting 5–10% of a home’s value. The square footage of the area to be transformed is also a key factor in estimating. Investment in a beautifully landscaped home can raise its perceived value between 12% and 15%. If your plans are ambitious, they can be phased in over time — start in year one and complete next steps in years two and three. It’s worth consulting a landscape designer to plan an approach that will build off the previous year’s efforts and with minimal disruption. For instance, don’t run a backhoe over the new front walkway to build the backyard patio in year two. Not big on saving for the phase-in plan? Consider financing your project over time or apply for a home equity loan. Who’s doing the work? You may be a green-thumbed DIYer with perfect design sense and the wherewithal to coordinate rental equipment, do precise measurements, and read up on the horticulture for your microclimate. Have at it. Or, maybe you’d appreciate the expertise of a full-service landscape company like Rock Solid that will translate your dream into a master plan and do the installation. We’ll supply the know-how, labor, equipment, and source the materials. You’ll get a patio design, retaining wall, water feature, and perennial plants that thrive in many soil and sun/shade conditions. What’s your timeline? The extent of your landscape design — and whether it includes hardscape (walls, patios, walkway), sprinklers, and/or plants — will influence the schedule. If you haven’t lined up appointments with potential landscape companies by February, get on their calendars now to receive a quote and a slot in their installation schedules. And remember, once you select a product, allow time for it to be ordered and delivered. Finally, there’s Mother Nature. She’s not all that predictable. And every landscape job is at her mercy. Make this the year you cure yard envy. Contact us today — 763-398-0739!